WHAT HAPPENS WHEN THE CASE IS SET FOR TRIAL? Once a felony case is set for trial the Federal Criminal Lawyer for the accused requests Discovery. This means that the prosecution will provide evidence to the accuser's attorney for review. 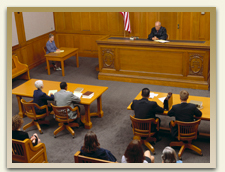 In Mississippi there are Court Rules that explain what evidence must be provided to the defense attorney. The defense attorney should independently confirm the evidence and should conduct his own investigation. During this process it is not uncommon for the prosecutor to convey a plea bargain offer to the accused through his attorney. A plea bargain is an offer to compromise the charges which may lower the seriousness of the felony, offering probation only, or offering a specific number of years in jail. In almost every criminal case the prosecutor conveys some type of plea bargain. The decision on whether or not to accept a plea bargain rests entirely in the hands of the accused. This decision is one that is serious, important, and can only be intelligently made after consultation with a zealous and competent attorney. IS IT BETTER TO GO TO TRIAL OR PLEA BARGAIN? The answer to this question is unique and individual to each person. In some instances the prosecutor may not offer a plea bargain, He/she may insist on going to trial and getting a conviction by the jury. Other times the prosecutor's offer may involve so much jail time that it makes no difference whether and accused goes to trial or not. Then again, the prosecutor may have a case wherein the facts do not point very strongly toward guilt and it may be to the advantage of the accused to proceed to trial. These decisions should be made after careful investigation and review of the facts and law, and after consulting with the client. The attorneys at Coxwell & Associates are criminal defense attorneys that specialize in trial and appeals. We do not accept representation with the goal of pleading the client guilty. We acknowledge that government statistics prove that most cases are resolved by plea bargains, however we take our oath and duty seriously. That oath requires that we aggressively and zealously represent our clients and provide them the best factual and legal defense available. Defenses are the factual or legal reasons why a person should not be found guilty of the crime with which they are charged. Legal defenses can arise from statutory rights or from either the Mississippi or Federal Constitutional. Some of the best know examples would be a Violation of the Fourth Amendment right against unreasonable search and seizure. Or a Violation of the well-know Miranda Rights. A factual defense might be Alibi, meaning the accused has witnesses who will testify under oath that the accused was not present at the time the crime was committed. It is important to remember that in order to be convicted of a crime all twelve (12) jurors must agree that the accused is guilty beyond a reasonable doubt. Since a criminal jury must be unanimous, it is critical that the attorneys representing the accused be experience and knowledgeable criminal trial attorney.